Whenever the season changes I'm always ready for a new bag! (Oh, who am I kidding, I'm always in the mood for a new purse!) Would you like to win something new to kick off spring? M. Avery Designs has generously offered to give away one of their new "Green Line" shoulder bags to one lucky Frugal and Fabulous reader! "Each bag is completely one of kind and uses 6 remnant pieces of upholstery fabric (3 in the front and 3 in the back), and the handles are made from leather fabric remnants so they will hold up to LOTS of wear and tear. The top of each bag is gathered so that the bottom is slightly larger than the top, creating gorgeous affect. 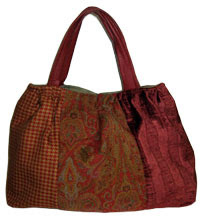 Each is lined with vintage fabric and has a large open pocket inside and each closes with a large, strong magnetic snap. The leather strap is about 22" long and just long enough to wear over your shoulder, but not too long so you can carry it in your hand as well." Want to learn more? Read more about the Green Line here! Want to win of one these fabulous bags?! *Browse through the M. Avery shop and tell me which bag is your favorite! P.S. : Do you live in the Hoboken, NJ area? Click here to read more about attending a jewelry or purse workshop or to host a design a bag party! Oh these bags are adorable! I can't decide which I like better...the Sandra Sand Velvet & Pink Peony or the Theresa Evening Bag with the huge pink bow on it. :o) Theres always room for another purse! So cute! I like the Green Line Shopper Green Trellis one best. Thanks for the chance. I love the black and white laptop messenger bag the best! I personally like the Patricia line of bags, the laptop bags :-) but I may be a bit biased. The clutches with the big bows on them are great too! I love the Mollie zippered shoulder bag. Too cute! Oh my, these bags are great!! I like the Molly Zipper Shoulder bag with the Elf Flower fabric. Thanks for the giveaway! Kate Pollo Jardin & Black Canvas is my favorite. Thank you. It's hard to choose a favortite with so many cute bags but I like the style of the Mollie Zipper Shoulder bags and the color of the Green Line Shopper Cherry. Anytime is a good time for a new purse! ;-) I love the Ashley Clutch Collection and the Green Line Shopper Green Trellis is absolutely adorable! I also subscribed via e-mail! I love these. I love the Green Line Cherry and Green Line Sand the best. I like the Mia Messanger bag. All of them a way cute! Awesome giveaway! I love the green one. I am going to blog about in about a few minutes. I BLOGGED ABOUT YOUR GIVEAWAY.. YAY! So creative! I love several but, if I had to choose, I really love Katie Dark Brown Leather & L'Afrique. I like the style of the Mia Messenger bag because I like to wear my bags across my body! I like the Shirley tote in the houndstooth fabric. Love them all! I love that they are eco friendly! I love all of the Green Line Shopper bags. I like the Sandra Sand Velvet and Pink Peony. I love the Karen Laptop Bag with shoulder straps. Lots of cute bags on the site though! Thanks! my favorite of the green line is the Green Trellis, but my fav from all the ones i looked at is definately the Irene Wristlet with the bow, sooo cute! I just suscribed too! Don't know why I didn't do it before, cause I love reading your blog daily! The vintage floral print Sandra bag is the cutest one around! I love the Green Line Shopper Cherry! M. Avery Designs has some CUTE bags! I think I need some of them!Thanks for the great giveaway! I really like the -Green Line Shopper Green Trellis bag. I love anything green! I'd love to have the cherry green line bag or a Jr. baby bag to use for an upcoming baby shower. Thanks for the giveaway! ilike the Kate estee flower shoulder hobo bag. I blogged this giveaway! Check it out Here! This is my second entry for my blog post about your giveaway! It's SO tough to pick a favorite...this beautiful work is just so unique! I really do love the Patricia Laptop Bag. Green Line Shopper Green Trellis is my favorite of the Green Line products. I'm also loving the Bailey & Bailey Jr. Baby Bags, my niece is due in June and it would be perfect for her! Actually...I'm a self-diagnosed purse addict, so I like everything. Those are just my top faves. I also tweeted http://twitter.com/kristinbrianne! I sure do hope I wiN!! These bags are adorable. I desperately need a new purse and would love to win a "Kate"
posting this contest to my blog. i also subscribed to your RSS feed so I wont miss anything! Thank you for posting this! I love the Green Line Shopper Cherry. The bags are GORGEOUS! I think the Green Line Shopper Green Trellis is my fave. I like the Irene Wristlet. ps u know i subscribe hee hee! thanks. 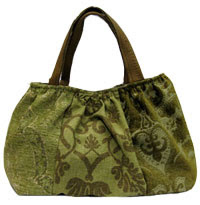 Green Line Shopper Green Trellis is very chic!!! I love these Bags.. Gosh are they Gorgeous and UNIQUE!!! I Love having a Bag that is different than everyone else!! Picking one was tough. I like the Patricia Laptop Bag. I love the Mollie Zipper Shoulder Bag. Thanks for the chance! I love the Karen laptop bag with the shoulder straps! How fun! Thanks for visiting my blog from UBP! Those are gorgeous bags! Consider me officially entered! I really like the Patricia Laptop Bag in the Black and White Stitch fabric... chic and modern and ever so functional. I like the Sandra bag in blue corduroy. I'm a blue jean type gal and this is perfect. I love the green trellis bag. I like the Katie Shoulder bag- Katie Nakahara. I love the Danielle Shoulder bag in Loteria print. I love your bklog and just subbed via bloglines. I like the Mollie Zipper Shoulder Bags the best. Thanks! I subscribed in a reader. Txs! Love the Karen laptop bag. I like the simple colors and fun floral design.